Encourage the Legislature to restore key budget language. Yesterday, Governor Charlie Baker signed into law parts of the FY'19 state budget, vetoed other sections, and amended certain outside sections. You can see the full $41.7 billion budget here . Thank you to everyone who took action, encouraging the Governor to preserve key investments and policy changes proposed by the Legislature in their FY'19 budget. Your hard work and advocacy have paid off! There are many victories to celebrate, including increased funding to address youth and young adult homelessness; more funds to prevent homelessness among families with children as well as elders, youth, and people with disabilities; the elimination of the homelessness penalty in the Emergency Aid to the Elderly, Disabled, and Children program (EAEDC), and increased funds for the Massachusetts Rental Voucher Program (MRVP), to name just a few. The chart with our full list of priorities and outcomes is being updated now. 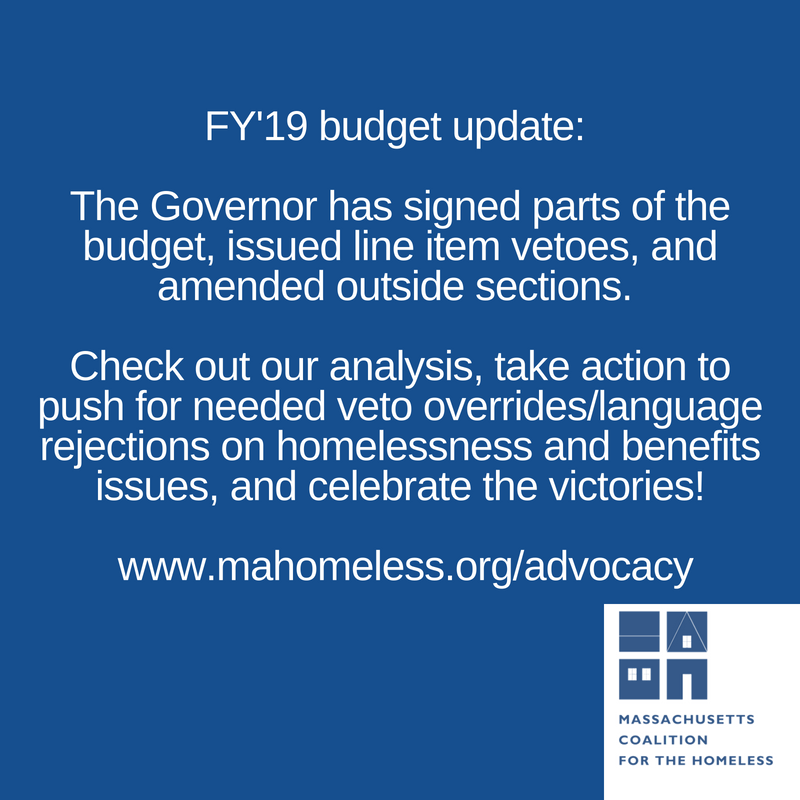 While the Governor issued very few vetoes when he signed the FY'19 budget yesterday (for a total of $48.9 million in cuts), we are working with legislative and advocacy allies to override vetoes and reject language changes related to Emergency Assistance family shelter and services (EA, via the Department of Housing and Community Development administrative line item, 7004-0099) and Transitional Aid to Families with Dependent Children (TAFDC, line item 4403-2000 and outside sections). The Legislature must take swift action, as formal sessions for this two-year legislative cycle end this Tuesday, July 31st. Our EA fact sheet is here . Please share it with your state legislators. 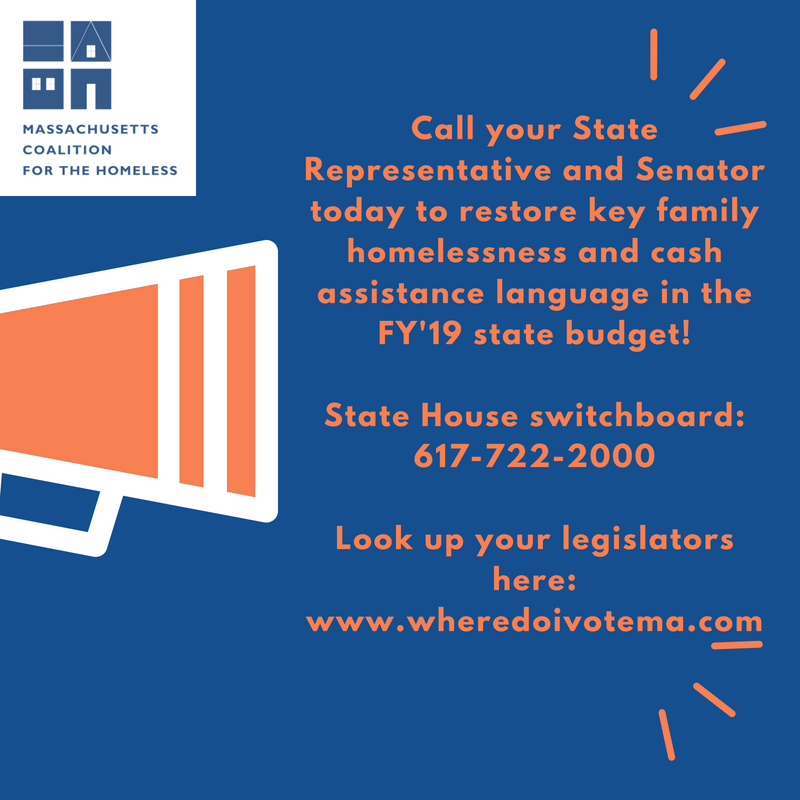 Please see our action step below and stay tuned for end-of-session updates on the budget and Senate Bill 2568, An Act to provide identification to homeless youth and families . Please contact your State Representative and Senator TODAY to push Legislative Leadership to override the Governor's vetoes and reject the TAFDC income-counting proposal. You can find your legislators' contact information via www.wheredoivotema.com or call the State House switchboard at 617-722-2000. Please also keep signing and sharing our one-minute online #EveryoneNeedsID action to Speaker Robert DeLeo and House Ways and Means Chair Jeff Sanchez in support of Senate Bill 2568.